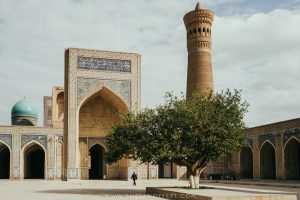 When discussing our plans for Uzbekistan with other travellers in Central Asia, Khiva was almost always the name that spilled from their lips in a whisper, like a secret confessed too soon. It’s far they said, but it’s so worth the effort to get there. And they couldn’t have been more right. While it was Samarkand and Bukhara we had high hopes for on Uzbekistan’s Silk Road, it was lovely little Khiva that stole our hearts. Once synonymous with slave trade and barbarism, Khiva, now akin to a living museum, is a delightful labyrinth of narrow mud-walled alleyways and spectacular blue mosaics that will sweep you back in time. 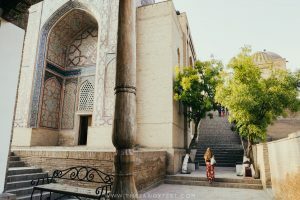 Though the tiny walled city in Uzbekistan’s west doesn’t feel quite as touristified as Bukhara and Samarkand, it’s certainly no stranger to foreign tourists. Set out to explore at peak times and you’ll inevitably find yourself among a sea of selfie sticks and package tour groups, but wander just a little way off the main thoroughfares and you’ll quickly see that away from the crowds, the city is still bursting with life. Away from the sometimes chaotic old-town streets, it’s the old men in traditional hats gabbing in the sunshine, the brightly dressed women sweeping the everpresent dust from their doorsteps, and the kittens and cows parading through their domains that represent the true nature of this charming ancient city. But that’s not to imply there’s nothing to enjoy in the more popular parts of town. Peak through any unassuming door along the main arteries of the city and be transported back centuries through the immaculate tilework and ornate craftsmanship that adorn every surface. From below, admire the elegantly tapered minarets wrapped in vibrant bands of turquoise and emerald, or climb the claustrophobic stairwells and be charmed by the city from above. And when your feet grow weary, find a perch atop the Ark and wait as the streets fall silent, the monochrome walls flush orange and the final rays of light melt away. 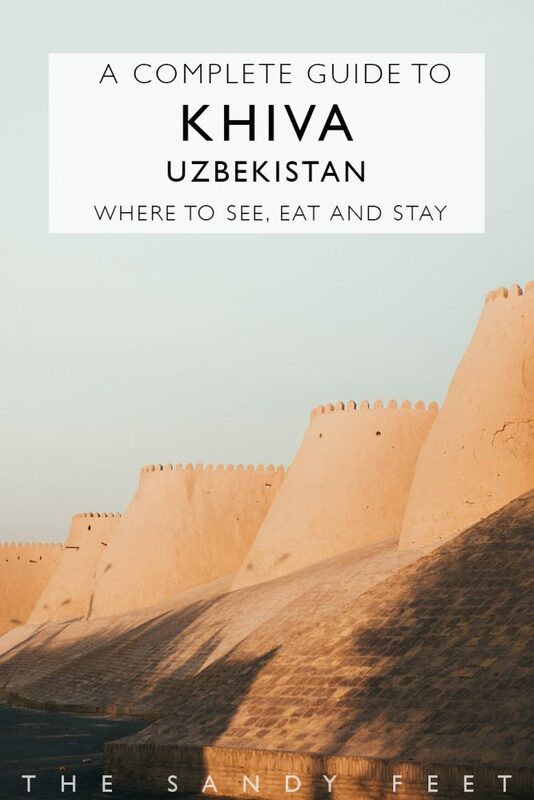 Khiva’s somewhat inconvenient location means many skip it altogether, but we’d consider it an essential part of Uzbekistan’s Silk Road story wrapped up in an enchanting, pocket-sized city. If you’re pushed for time, the most impressive sights can be ticked off in a day but, as always, we’d recommend giving yourself a little more time to enjoy Khiva’s beauty at a slower pace. 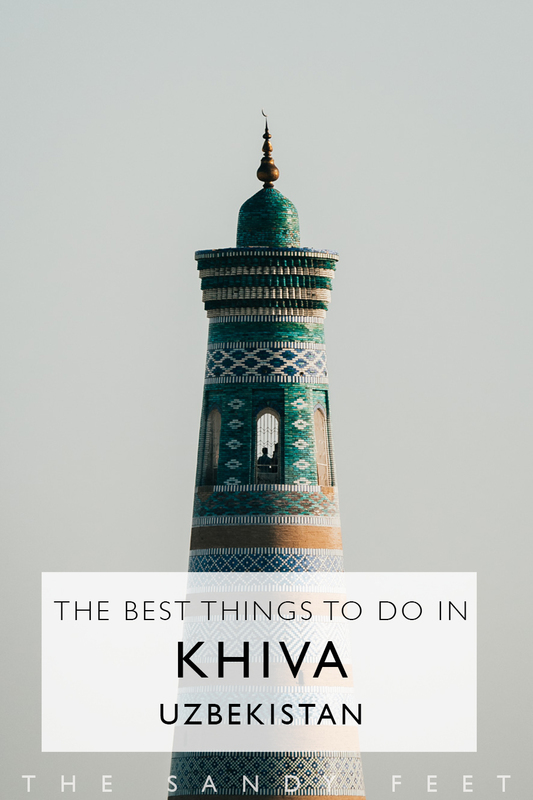 These were our favourite things to do in Khiva, what we think you should see, do and eat. On any wander through Khiva, you’ll happen upon numerous medrassas boasting impressive tilework and tiny rooms, winding alleyways perfect for getting lost in and brightly coloured mosques and minarets waiting to be explored. Helpfully, there is a single ticket, sold at the west gate, that can be used to gain access to most of the city’s tourist sights and is valid for two days. The ticket costs 51,000 som ($6.30) per person, plus a 15,000 som ($1.90) camera fee. Attractions requiring extra payment tend to have a small cashier desk at the entrance. 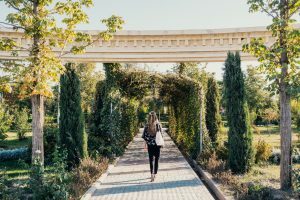 As we found with all the Silk Road stops in Uzbekistan, the tacky souvenir stands that cluster through many of the entrances can detract a little from the overall charm, but explore around sunrise and sunset to experience the place completely unspoiled. Although the usually leafy courtyard was under renovation during our visit, the interiors, with every inch adorned in blue and white tile work, is simply beautiful. The sacred site which sits below the turquoise dome that dominates Khiva’s skyline, houses the tomb of Pahlavon Mahmoud, Khiva’s patron saint among other accolades. The chamber that houses the mausoleum, as well as the chambers surrounding the courtyard, are places of worship and sanctuary for the townspeople so remember to be respectful at all times when exploring, especially when visiting as a group. Shoes should be removed before entering. Price: Not included in the city-wide ticket. Entry is 6,000 som ($0.70). Accessible through the Kuhna Ark, the Watchtower provides the perfect vantage point for sunset and is almost an obligatory stop during your time in Khiva. After admiring the beautiful tile work and ceiling design in the Summer Mosque, clamber up the steep, dimly lit stairwell to enjoy the views of Khiva from above; the undulating city wall from up high is particularly beautiful. Of course, the views on offer make this a rather popular evening hangout so try to arrive about an hour before sunset and you may just have the place all to yourself – for a short while at least. Price: Entry to Kuhna Ark is included in the city-wide ticket, though access to the Watchtower is an additional 7,000 som ($0.80). READ NEXT: THE BEST THINGS TO DO IN MAGNIFICENT SAMARKAND. The peaceful haven of the Juma Mosque is unlike anywhere else we visited in Uzbekistan or indeed, Central Asia. The main chamber is divided by a muddle of 218 columns, some dating back to the 10th century, and is focused around a small garden. This is a place where silence reigns, where tour groups drift through in a whoosh of whispers, and footsteps echo through the cavernous room; a prime spot to escape the sometimes frenetic chaos of the main streets. Understandably, this is another popular spot with tour groups, but wait a while and you’ll find a solitary moment. Price: Included with the city-wide ticket. With so much to see in Khiva’s jam-packed centre, it’s easy to forget there’s more to the city than just it’s tourist hotspots. Explore north or south of the town’s main arteries, where hawkers struggle for attention and tour groups bustle relentlessly, and you’ll discover a different kind of Khiva hidden within the diminutive walled city. One that is far simpler, more authentic and certainly less chaotic. 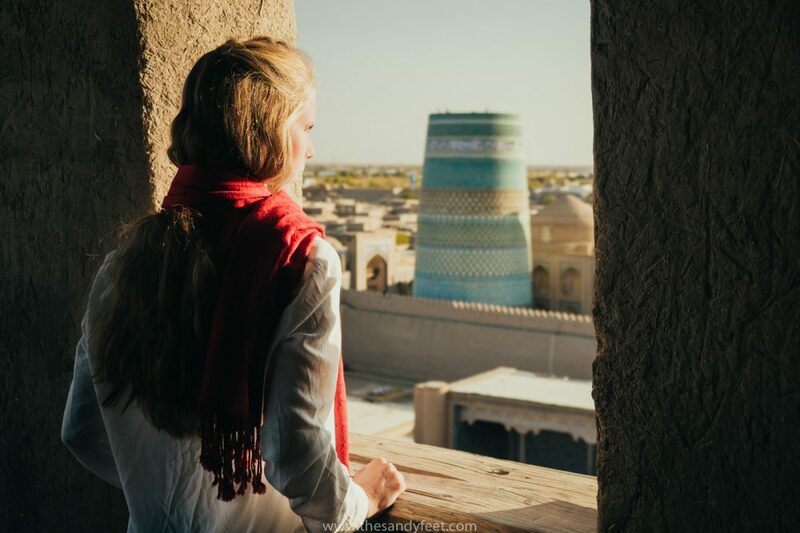 As the tallest minaret in Uzbekistan, and in our opinions, the most beautiful, you can expect the view from way up here to be something quite special. If, like Freya, you have a slight fear of stairs that creak and wobble with every step while hovering way above the ground, rest assured, this tower is perfectly solid with a steep and narrow brick stairwell that winds its way to the very top. The madrassa at its base houses the Museum of Applied Arts – said to be Khiva’s best museum – is worth a look in if you’re into ancient artefacts and have the time. As we found with most museums in Uzbekistan, very little additional information is provided. Price: Museum is included in the city-wide ticket. Climbing the minaret is an additional 7,000 som ($0.80). DON’T MISS: A SHORT GUIDE TO BUKHARA, UZBEKISTAN’S HOLIEST CITY. If you were under the impression this place was all about the tourists, the main bazaar sprawling out from the east gate will quickly jolt you back to reality. One of the more lively bazaars we’ve seen, this place is perfect for people watching, sampling some delicious pumpkin samsa and getting altogether lost in the crowd. You won’t be hassled here either. Arrive early on Sunday morning (before 10AM) to see the animal market in full swing where poultry is the main trade. Unfortunately, both times we sauntered away from the city-walls to visit the Isfandiyar Palace, it was closed. From what we’ve seen online though, the over-the-top decor and extravagant chandeliers would make this an interesting stop while in Khiva. Plus, it’s just a short 10-minute walk outside the west gate. Price: Included in the city-wide ticket. Having spent most of our time in Central Asia unenthusiastically munching through what felt like our 1,000th bowl of plov, we were so relieved to find some new, tasty local cuisine to try – Khiva’s signature dish, shivit oshi, a pasta infused with dill and topped with a vegetable (or meat) stew. Delicious! Admittedly, all the restaurants within the city walls are quite touristy and more expensive than outside, but it was here that we ate some of the best food we had in Uzbekistan and still at a very affordable price. Khorezm Art Cafe, conveniently located about 100m from our guesthouse, quickly became our favourite place to eat, and after trying a number of other places in town, we’re convinced it’s the best option for both quality and value. Service was always fast and pleasant, food was delicious and although it looks a little more upmarket than other places in town, prices were exceptionally affordable, with salads and soups starting at 5,000 som ($0.60) and mains ranging from 11,000 to 22,000 som ($1.40 to $2.70). Check the latest reviews on TripAdvisor here. Kazan is another decent option located right in the centre of the walled-city with an extensive menu of local, Russian, and some western options at decent prices. Zerafshon came highly recommended by our hostel and also had delicious meals, particularly their salads, but we found their prices were close to double everywhere else we ate. Eat here if you want something a little fancier. Check the latest reviews on TripAdvisor here. As we visited in the off-season, nowhere could ever really be considered that busy. We have read that in peak season though, some of these places can become absurdly packed with large groups. If this is the case and you’re looking for a more authentic dining experience, head on over to the bazaar where you’ll find cheap local dishes for a fraction of the price. Take our host’s advice though, if it smells a little funky, move right along. To experience the ambience of Khiva’s deserted old-town streets at night, we would highly recommend staying inside the city walls if you can. If not, there are a number of hotels located just beyond the various gates which would also be useful options. Islambek Hotel | We stayed at the main building of this lovely guesthouse, though there is also a second property around the corner, and loved it. Breakfast was hearty with bread, fruit and eggs, rooms were more spacious than most we stayed at in Uzbekistan, and the owner was friendly and very helpful in planning our visit. Check here for rates and availability, or read the latest reviews on TripAdvisor. Meros B&B | This charming bed and breakfast is another highly recommended option on the other side of the old town, but with just six rooms, bookings can be hard to come by. Over winter, many guesthouses also close up shop so we’d recommend booking ahead of time and not just showing up on a whim if you’re travelling in low season. Looking for something else, search for other accommodation options in Khiva here. Nearby Urgench acts as the main transport hub for Khiva. Trains head to and from Tashkent daily via Samarkand, as do flights. Trains to Tashkent leave at 2:35PM and 7PM and take 17 hours. A 1st class ticket will set you back 320,000 som ($40), 2nd class (kupe) is 170,000 som ($21), and 3rd class (platskart) is the cheapest option but with only open seating. If you’re passing through Urgench on your way to Khiva and have a fixed itinerary, we’d recommend buying your train ticket in advance as, even in low season, tickets can book up fast especially on weekends. Otherwise, there is a ticket office a few hundred metres beyond the north gate (the exact location is marked on Maps.Me) where tickets can be purchased for a 10,000 som commission per ticket. Be sure to bring your passport with you. 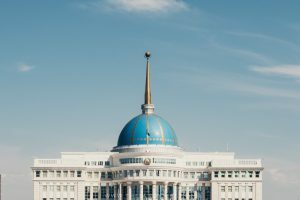 For up-to-date timetable information, search the Uzbekistan rail timetable here, though we found the website often has issues and doesn’t work out of the country. 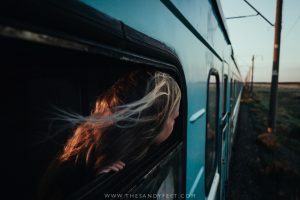 Those heading to Bukhara can take a train from Urgench and most likely change in Navoi, but connections tend to be in the middle of the night. You’re far better off getting a shared taxi directly from Khiva to Bukhara. Your guesthouse can organise this for you and connect you with other travellers to share the cost. Prices are generally around 100,000 som ($12) pp for a car of four. Hi! I love your guides to Uzbekistan! Question: How long did you stay in Khiva? We’ll be traveling to Khiva via Bukhara and are wondering how to space out our days. Thank you – that makes us so happy! We had 2.5 days in Khiva, 2 in Bukhara and 2.5 in Samarkand. Have a great trip! At the moment we are planning a trip and your blogs makes us very excited. 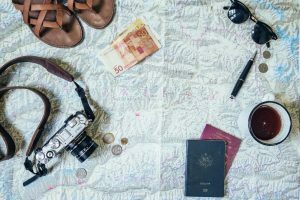 – How long did you travel Uzbekistan for? 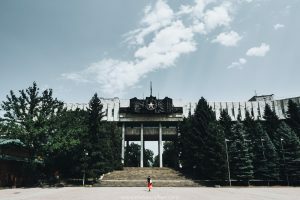 – Do you think it is doable do a small piece of Kygyzstan in one week and add 2 weeks of Uzbekistan? Or would you advise us just to leave it at Uzbekistan. Since we like to combine the nature with culture we thought this would be the perfect mix but maby it will be too rushed? I had 2 weeks, but could definitely have done the same in 10 days as there were a few wasted days along the way organising flights and trains etc. 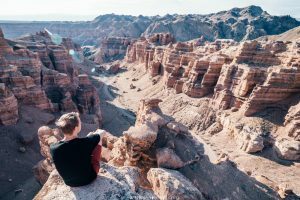 Adding a week in Kyrgyzstan sounds like an excellent idea, or even 10 days if you stuck to just the main 3 cities in Uzbekistan. The nature in Kyrgyzstan is definitely worth the trip! Thanks so much for your answer. Didn’t see it until now. Now we are thinking about flying directly to Osh (from home), starting with the pamir highway for about 10/11 days and than going to Uzbekistan for 10 days. 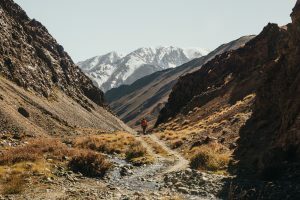 Would you rather advice people to do 1 week Kyrgyzstan and 1 week Uzbekistan (like my message before) or would you rather do the pamir highway and than Uzbekistan? Unfortunately we don’t have the time like you guys did but like to make the most of our three weeks off! 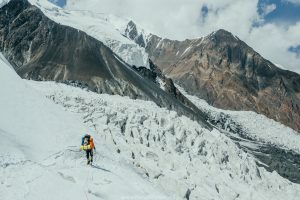 That’s kind of the thing with the Pamir Highway – once you know it’s there, you want to get there right away! Honestly, that’s a tricky one though as both will give you a completely different experience so it probably depends on what you’re after. The Pamir Highway is incredible, but the nature is very barren and there’s a lot of time spent driving. 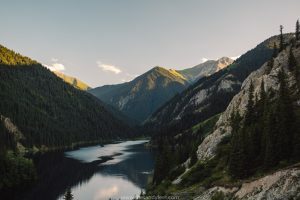 If you were to get to eastern Kyrgyzstan, the mountains are super lush and green with glaciers and lakes so the scenery is quite different. It probably depends on whether you’re after more hiking or insane landscapes. Really, you can’t go wrong with either option! 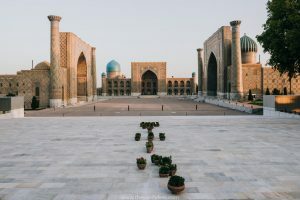 Hello, I am currently planning my trip to Uzbekistan, I think I can manage the bigger cities on my own with my research and stuff, but do you think I need a guide for Khiva? If so, any recommendations?